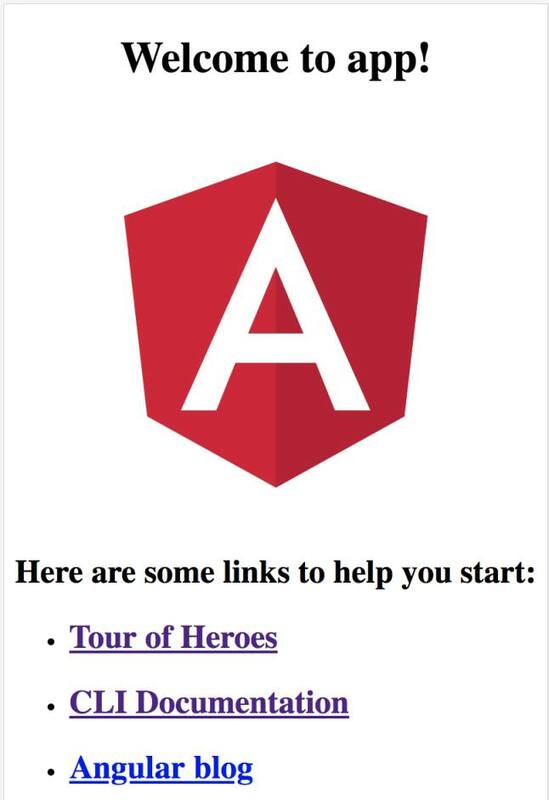 The first part demonstrates how to create a simple Angular 6 App using Angular CLI and explains the project structure. The second part explains existing code that I have posted in GitHub. This code demonstrates the use of components, services, HTTP client, and communication between components. You need Node.js, since the libraries required for Angular are downloaded using node package manager (npm) . Refer to https://nodejs.org/en/ to install Node.js. Angular CLI helps in creating a project very easily. In order to create the project, use the following command. Go to your browser and go the following URL: localhost:4200. You should be able to see that your application is running. package.json: This file has the list of node dependencies which are needed. src/styles.css: This file has the global CSS available throughout the application. src/main.ts: This is the main file which starts the Angular Application (AppModule is bootstrapped here as seen in the code ). Here the Extension .ts stands for TypeScript. src/index.html: This the first file which executes alongside main.ts when the page loads. src/app/app.module.ts: This is the file where all the components, providers, and modules are defined. Without defining them here, they can’t be used elsewhere in the code. src/app/app.component.html: This is the main component of an angular app, and all other components are usually present within this component. src/app/app.component.ts is the logic for this component, and src/app/app.component.css is the CSS for this component. This component itself does not do any important logic, but acts as a container for other components. Component: A component in Angular does a specific function. An Angular application is built by using various components. Angular CLI can be used to create components easily. The syntax is ng generate component [name]. Use the following command to create a component called “customers”. and a customers.component.spec.ts file which is used for unit testing (the spec wont be explained in this post). The service is created inside src/app. The service created has a data.service.ts file which has the logic and a data.service.spec.ts file for unit testing. You have successfully created your first Angular 6 app and have also learned how to create components and services. Also now you have learned the basic folder structure of an Angular 6 project. The next part will explain the existing GitHub code to demonstrate how to use components, services, HTTP client, and communication between components. This code is being explained here, so clone the repo onto your local machine. The repo has instructions on how to clone it and set it up. To see how the final application looks, you can click on this URL. This will give you a good idea as to what the application is trying to do. The goal of the application is to display a list of customers in the form of cards. When the customer data is clicked, then the application switches to a new page which then displays the details of the selected customer. CustomersComponent: This corresponds to the src/app/customers folder. This component is to display the list of customers. The customers.component.ts file has a function called ngOnInit(). This function is called whenever the component is loaded. So this function can be used to load the data for the component. That data is loaded by calling the getCustomerList() function. getCustomerList() in turn calls the data service to get the data needed. 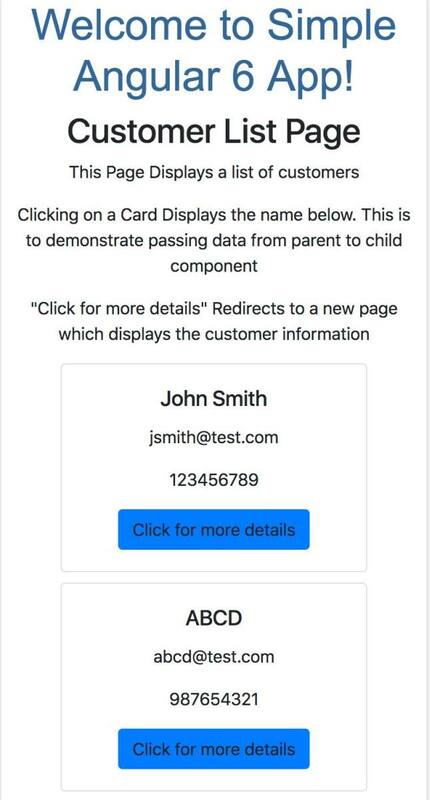 CustomerdetailsComponent: This corresponds to the src/app/customerdetails folder. This component displays the details for a single selected customer. The customerdetails.component.ts file has the ngOnInit() function which can be used to load the data. To load data, the getCustomerDetails() function is called. This function makes a call to the data service to get the data needed. But here you will also notice the use of routeParams.id which is sent to the service. routeParams is used to get parameters from the application URL, and the id parameter is used to find out for which customer the details need to be loaded. This will become more clear when I get to the routing part. DisplayComponent: This corresponds to the src/app/display folder. This component displays the customer name clicked in the CustomersComponent. (The whole point for this component is to demonstrate parent to child component communication.) This is a child component of CustomersComponent. In customers.component.html you will notice that <app-display [customer] = selectedCustomer> </app-display>. This makes DisplayComponent a child component of CustomersComponent. Data is passed from CustomerComponent to DisplayComponent using the [customer] attribute. The sample data is present in the src/assets/samplejson folder. DataService: This corresponds to src/app/data.service.ts. All the JSON used in the application is stored in the src/assets/samplejson folder. DataService helps in getting the JSON from the src/assets/samplejson folder using an HTTP request. In real applications, the service helps get the data from a Rest API or any other API by making an HTTP Request. This service is used by both the CustomersComponent and CustomerdetailsComponent. Customer: This corresponds to src/app/customer.ts. This is the model class used for the CustomersComponent to define the structure of each customer in the list. CustomerDetails: This corresponds to src/app/customerdetails.ts. This is the model class used for CustomerdetailsComponent to define the structure containing all the customer details. The routing module is defined in src/app/app-routing.module.ts. This module is then applied to the application by adding <router-outlet></router-outlet> in app.component.html. /customers : This URL displays the customer list and points to CustomersComponent. /customerdetails/:id: This URL displays the details for each customer and points to CustomerdetailsComponent. The id which is present in this URL is the routeParam. This id in turn is used by the CustomerdetailsComponent to know which customer’s details to display. For Example /customerdetails/1 will display the details of the first customer, /customerdetails/3 will display the details of the 3rd customer, and so on. Now you know how to use components and services. Also you know how to make HTTP calls, how to use routing, and how to pass routeParams.